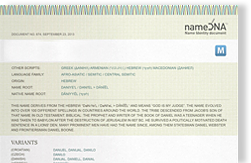 This name derives from the Hebrew “Bārkiʼēl”, meaning “lightning of God”. Barachiel is one of the seven Archangels in Eastern Orthodox tradition. In the Third Book of Enoch he is described as one of the angelic princes, with a myriad of some 496,000 ministering angels attending him. He is counted as one of the four ruling seraphim, and counted the prince of the second heaven and of the order of confessors. He is described in the Almadel of Solomon as one of the chief angels of the first and fourth Chora. He is regarded as the angel of lightning.